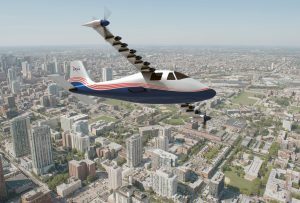 Looking to the future of air travel in congested urban settings, NASA has established the Urban Air Mobility initiative. NASA plans on creating an air transportation system that is organized, safe and effective by partnering with industry, governments and academics. With the rise of drones and the real possibility of personal aircrafts in the future, preempting the possible pain points and minimizing accidents is their goal. Low-altitude airspace was a little used section of the sky, mostly reserved for hobbyists and helicopters. Today, with the advent of more robust drone technology and its wider mainstream use, regulation of this airspace is a growing concern. There is the fear of drones crashing not only into the ground, buildings and people but into each other and larger aircrafts that fly at higher altitudes. Part of the plan is looking into a management system that models the current road structure, including lanes, stop lights and right of ways. An established set of rules enforced early on should reduce complications later when the technology is more widespread. If all drones follow the same system and meet the same standards, much of the operation can be automated, saving time and money. Staying ahead of the game is key. Setting standards that can be implemented early will smooth out the process, especially as new types of low-altitude aircrafts enter the scene, like flying cars. Didn’t see that one coming, did you? That’s because it’s not, not like in Blade Runner anyways. Instead, imagine small passenger planes that run like taxi cabs. You can read more about this in my other monthly article here. NASA is working on an electric plane called the X-57 Maxwell. The plane is a modified Italian Tecnam P2006T, giving researchers an existing plane to compare the efficiency of the new plane. By starting with smaller drone prototypes then leveling up the size, NASA can make and implement changes quickly while keeping costs low. 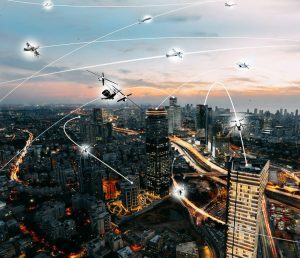 The combination of drones and small planes crisscrossing each other in cities and suburbs is an eminent problem that NASA is actively working on. Accepting insight from multiple stakeholders will help anticipate the future of low-altitude airspace in ways we can’t even imagine. This entry was posted in The Geospatial Times and tagged NASA, NASA is cool, Reaching Orbit, The Geospatial Times, Tips & Tech by Apollo Mapping. Bookmark the permalink.